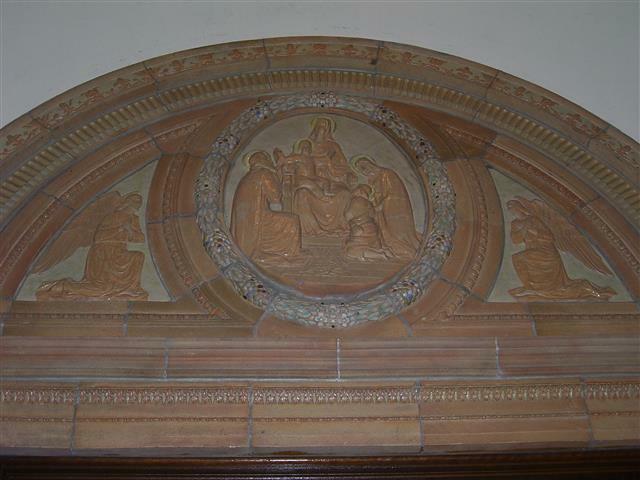 “Scripture does not record the meeting of the little Jesus and John, but it was a frequent medieval and Renaissance subject,” and is depicted in this terra cotta oval relief over the center front door in the Narthex of Blessed Trinity Church. (Rev. Walter Kern’s “Guidebook to Blessed Trinity R.C. Church,” page 18). Sunday, June 23 following the 10:00 a.m. Mass ~ Anointing of the Sick. Thursday, June 27 at 8:00 p.m ~ Bingo will be played in St. Charles Hall. Saturday, June 29 at 8:00 p.m ~ Bingo will be played in St. Charles Hall. Monday, June 24 ~ The Nativity of St. John the Baptist ~ Communion Service at 11 a.m.
We’ve Conquered Cocoa! Now What ??? ~ Sister Claire Edwards, Daughter of Charity from Sisters Hospital, B. T. Parishioner, Member of the Choir and Member of Parish Council, offers us a challenge. For the past four years, Sister has been involved with Project Homeless Connect, an initiative of the WNY Alliance for the Homeless. Each year a day is set aside to provide many services to homeless people. This year on September 5 they will have the 5th Annual Project Homeless Connect Day at the Buffalo Niagara Convention Center. Almost 75 service providers – from barbers and hair stylists to Veteran’s Benefits and Dental Care to Social Services to Family Service, etc. – all gathered together that day volunteering services to our neighbors who are homeless. Last year they served almost 700 people. This project doesn’t solve the problem of homelessness (the Alliance is also working on this larger issue), but it does show homeless people and families that the community is aware of and cares for them, – and it exposes many volunteers and service providers to this needy group in our midst. And Now OUR Challenge: As each homeless person leaves “Connect Day,” they are given a bag of personal items, donated from a variety of sources: socks, soap, tooth brushes, toothpaste, first aid kits, shaving cream for men and hygiene products for women. One item that is needed is (are you ready? ): DEODORANT. Sister Claire asks: “Could we ask our parishioners at Blessed Trinity to collect deodorant for this purpose on the weekends of July? The Parish Council responded affirmatively. So, we ask you to become a part of this effort to reach out to our needy neighbors in this very simple, basic way. We will have containers placed in church during July for your contributions. We will need deodorants for men and women. And do note: deodorants can be purchased from The Dollar Store for $1.00. Thank you for your generous cooperation!!! Summer in the City, organized by the churches of Central City, will take place Sunday, August 4, at Ss. Columba-Brigid Church, 75 Hickory at Eagle. There is a need for many volunteers to bake desserts, work at our parish food tent, and to help with set-up, parking, serving and clean-up, etc. If you can lend a hand, there is a sign-up sheet on the altar railing near Mary’s shrine. Congratulations to Robert Sands (son of Elizabeth) and his family. A sophomore at Canisius High School, Robert received Second Honors during this past marking period. Attention Parents! Just a reminder that information regarding summer activities for children has been/is displayed on the table in the front vestibule. We are beginning to receive Back-to-School Information as well, and it, too, will be placed on the vestibule table. Empower. Kritika and Ankit, featured on this year’s Catholic Charities Appeal brochures and posters, and their older siblings and parents, comprise the Karna Bahadur Rai family. They were empowered two years ago when Catholic Charities gave them a new start in this country after they escaped from Burma. The family lived in a camp in Nepal sponsored by Catholic Relief Services until they were given refugee status by the UN High Commissioner for Refugees and a country was chosen for them. Catholic Charities set up an apartment for them, enrolled them in English as Second Language classes and the children in school, and helped the parents find jobs – another family you empower when you donate to the Appeal in support of Catholic Charities. The Appeal ends this week, June 30. If you have already given, thank you! If not, please go to www.ccwny.org and make a secure online donation credited to your parish or mail a gift to 741 Delaware Ave., Buffalo, NY. Find us on Facebook at facebook.com/ccbuffalo. Chicken Barbecue ~ Save the Date: Saturday, June 29, 3:00—7:00 p.m. St. Lawrence Parish, 1520 East Delavan Ave., is sponsoring a barbecue dinner. BW BBQ will be cooking up chicken and ribs along with a chef salad, buttered potatoes and roll & butter. Presale Chicken dinners are $9.00 and Chicken & Ribs are $10.00. For more information or presale tickets please call the rectory during business hours at 892-2471. Dinners cost a dollar more when purchased on the day of the event. All dinners include a dessert and beverage. Proceeds benefit St. Lawrence Church. Mount St. Mary Academy is hosting a Chiavetta’s Barbeque on Sunday, July 14. Bring the family for an afternoon picnic or take dinner home for your crew. Dinners will be served from noon to 4:00 p.m. Drive-through only at 3756 Delaware Avenue, Kenmore, NY 14217. Tickets are priced at $10 and are available on-site or by pre-sale. To purchase pre-sale tickets, please contact Mount St. Mary Academy at (716) 877-1358. All proceeds will benefit the Mount St. Mary Academy Alumnae Scholarship.The Annulment Process ~ If you or someone you know is thinking about applying for an annulment, plan to attend the Annulment Workshop on Tuesday, July 16 from 6:30 p.m. to 9 p.m. in the UB Newman Center, 495 Skinnersville Road (the traffic light just past Sweet Home High School) in Amherst. To register, call Barbara Wyse at 633-7786. Volunteer Opportunities at Sisters Hospital ~ Guardian Angel Ministry Program: The Long Term Care Homes of the Catholic Health Care System in WNY are currently expanding our Guardian Angel Ministry Program. This unique and challenging ministry provides companionship for residents as they enter their final stages of living. This distinctive End of Life Program, offers support for family members who are unable to be with their loved ones during the overnight hours (11 p.m. – 7 a.m.) as the resident approaches death. The program is designed to give families a brief respite and peace of mind knowing that someone is offering spiritual support and companionship to their loved one. The loved one will not die alone. Volunteers sign up for a 4 hour shift and average no more than one shift per month. For more information or to volunteer, please contact: Chaplain Jonathan Moran at Saint Catherine Labourè 862-1538.